Dream Circle collaborated with mcs and producers from around the world for their latest release, Soul Technology Remixes. The duo introduces rapper and self proclaimed Chrononaut, Omboy Rॐ, a Brooklyn born artist harnessing his creativity for a higher purpose. Dedicated to inspire, Rॐ creates music and other forms of art on his mission to transcend societal constructs and artificial time. Also featured on the EP is Natrix. Yazz Garcia, a.k.a Natrix is a Colombian peace activist, Hip Hop dancer, and latina Emcee, settled in the United States in 2010. Born in San Andres Islas in 1978, she grew up in the city of Medellin in complex times of violence. In her teens she was devoted to teaching dance, and worked on creating conscious music and organizing events for young people as a form of resistance to tension that violence generated. She participated in two musical productions as lyrical composer and singer, “Colombianos de Barrio” in 1999 and “Frecuencia” in 2003 with the Hip Hop band Alianzagalactik, a group dedicated to social work, with critical content lyrics. Manwel T provides the dub and reggae remixes on the EP. He is a reggae/dub producer and remixer based in Malta. Most of his numerous dub remixes have been released on his own Dubkey label. In the summer of 2014 he started composing and producing his own tunes: heavy roots reggae and ska instrumentals plus dubs, with prominent horns. Bad Space Monkey, an electronic music producer from Estonia, has done several epic Dream Circle remixesfeatured on international blogs. The Dream Circle ‘On Your Way Remixes’ feature house, dub, downtempo and drum & bass remixes by Bad Space Monkey, Constantin, Imaginary Unit, Zaunga, Doc Zee, Raxizoem, Bronksi and Dimzo. From Imaginary Unit’s spaced out dub remix via Cartagena, Colombia to classic drum & bass from Germany to Dutch style house for the club, this is an anthem that will reverse those creeping feelings of powerlessness. Vote up the Bad Space Monkey remix on Hype Machine. “Soul Technology”, is a follow up to Dream Circle’s first LP, “Lost Art”, bringing forth the same message of positive soul empowerment. With rave responses from indie music lovers, and the European underground music scene, their following continues to grow as people feel touched by their mission to celebrate the human soul and a conscious existence. You can find sound bites of their music in their documentary film “Time is Art” where they further showcase in the medium of film what they aspire in their art. Dream Circle believes that “art should ultimately disturb the comfortable and comfort the disturbed”. Time is Art is a documentary film that follows the journey of a writer, compelled to make sense of the mysterious and powerful energy she felt at her aunt’s deathbed. Considering herself a skeptic, a series of strange coincidences leads her on an exploration of synchronicity – the concept that everything is interconnected and that time is not so much a chronology as it is an infinite cycle. The music featured in the film is deeply emotional, dreamy and transcendental. 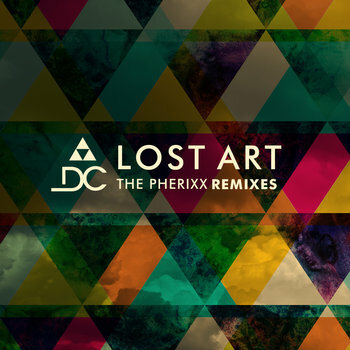 For those who couldn’t get enough of Dream Circle’s debut, Lost Art, Pherixx’s take on his favorite tracks from the album will hit the spot. In remix fashion, each track provides an interesting spin on the original version. From the dance-floor friendly retro house remix of “The Hurricane” to a futuristic hip-hop remix of the dub-reggae infused “Original”, to “School of Life” which features rapper, Los the Light Bearer, to lush downtempo re-imaginings of “Space Born and “Dark Star”, budding producer and remixer, Pherixx, undoubtedly brings new life to the songs. Dream Circle’s So Many Things is an uplifting and empowering song that is sure to inspire. Each remix has its own particular vibe, from the mellow and melodic BLUEdream and A-Frillz 4:20 style remixes to the deep sounds of Doctrations, dance-floor friendly house remixes by OP!, Bad Space Monkey & Yves Atom Kline to the drum & bass remix by Deceiving Sounds out of the U.K. Included on this EP Pherixx’s softer version and with its strong piano lead, it rounds out the EP nicely. The music of Brooklyn’s Dream Circle is an eclectic, genre-bending journey into electronic, house, hip-hop, dub reggae and African music. For fans of of artists such as Santigold and Massive Attack who enjoy conscious lyrics, the collection features space-hopper Johnny Voltik dropping his unique blend of soul on “School of Life”. On “You Remind Me,” Dominican poet and songstress Stephanie Morillo’s dreamy vocals glide over tabla drums and take the listener to an even higher dimension. The featured singles, So Many Things, Dark Star & The Hurricane are the albums stand out tracks. The inspiration for this album varies from Radiohead to Berlin artist, Apparat, Portishead, dub and soul music, film soundtracks and old-school production techniques. Overall, the music is hard to define, as it combines elements of film music, hip hop, R&B, dub, and reggae. The album features Yadira Brown who wrote & performed “Sweet Relief ”. Yadira is an Austin-based artist whose music mixes electronic production with the singer’s warm, powerful voice and passionate lyrics to produce a unique, mature sound that stands completely on its own. In the past she appeared on the Living Legends (the Grouch) and Bus Drivers albums. Vocalist Dee Teague performed “Free like Me” which plays frequently on Music Choice. Singer/song-writer, Irene Merring sang and arranged “Time Will Tell”, written by Katy Walker. Jazz trumpet player, Fabio Morgera is also featured on the upbeat song “Latin vs. Jazz”. A dub/soul/indie infused journey with grimy guitars/synths/pianos/heavy beats, melancholy melodies and dreamy lyrics. Written and produced by M.O. with additional production by RVRS:PLAY, Doctrations, HNH (Katy Walker, Mike Genato).